The Chihuahua dog breed originated in Chihuahua, Mexico, but it’s spread pretty far from its hometown. You can find the best dog food for your chihuahua with our well-researched reviews of some of the best options out there! But before checking out our reviews, here are some product features to consider when choosing a dog food for your chihuahua. Food Type - Wet food is great for weight loss, but dry dog food is usually less expensive with great nutritional value. Dog Age - Make sure the dog food you choose is made to work with your dog’s age, from puppy to adult to senior. 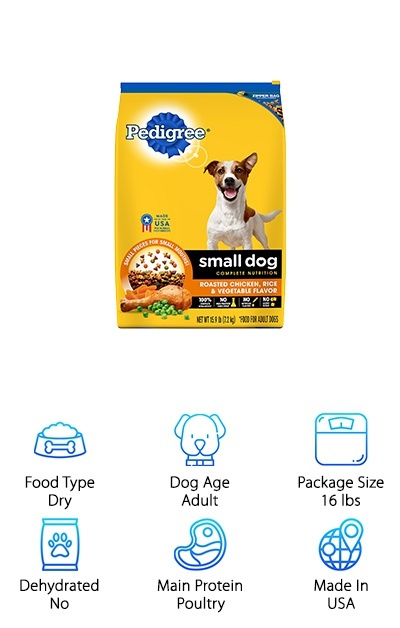 Package Size - Consider the package size to compare value or experiment, especially if you have a herd of little chihuahuas to feed! Dehydrated - Why pay for the water in wet dog food when you could rehydrate your dog’s next meal yourself? Main Protein - Picky dogs or dogs with food sensitivities may prefer different types of protein like lamb or fish instead of beef or chicken. Made In - Nothing’s better than knowing your dog’s meal was made in the USA, where manufacturing guidelines are strict. Let’s chow down on some reviews! Our top pick and budget pick are some of the best breed-specific options for your chihuahua, but other small breed dog foods can also be a great choice--so we reviewed those, too! With an aroma your dog will find delicious, this dog food from Royal Canin is specifically designed for the chihuahua breed. The kibble pieces are small and less crunchy than foods for larger breeds, so they’re easier for your pup to chew. This nutritious dog food is easy to digest and can help improve a chihuahua’s sometimes fussy appetite. It’s available in 2.5-pound and 10-pound bags, depending on your needs. Supplements like omega-3, omega-6, and biotin support your dog’s skin and coat health. A high-quality carbohydrate source and highly digestible proteins keep the GI tract happy and moving with no upset stomachs. Love the idea of a breed-specific dog food for your growing chihuahua? 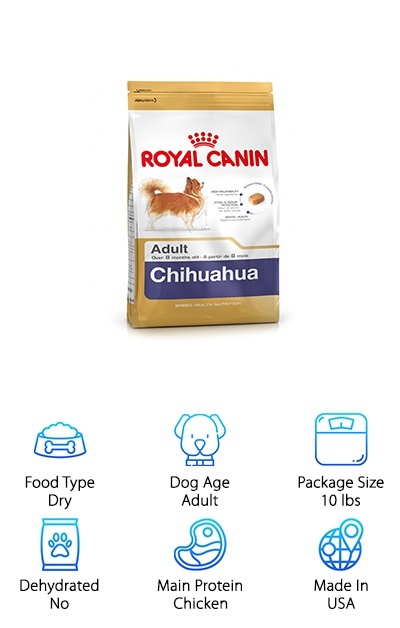 Royal Canin offers some of the best food for your chihuahua puppy in their breed-specific line, too! This food may be a good choice for picky eaters due to the tasty, tender kibble pieces, but you can find similar nutrition options from other small breed dog foods as well. 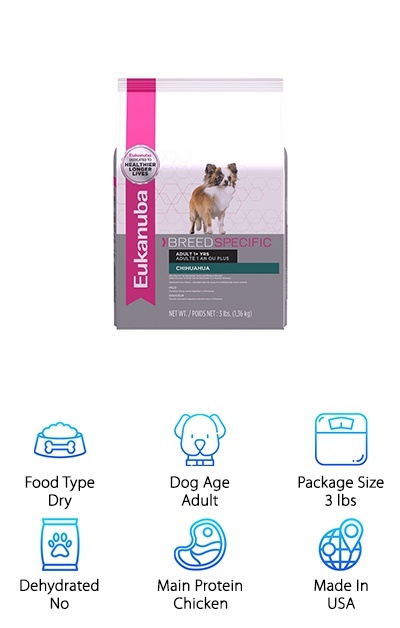 If your idea of the best food for chihuahuas is one that’s tailor-made for the chihuahua breed, Eukanuba should be at the top of your list. It’s also our budget pick, offering great bang for your buck! Chicken is the first ingredient, paired with tons of vitamins and minerals for total nutrition. The Eukanuba 3D DentaDefense System helps to reduce tartar build-up and help your dog “brush” their teeth with every meal. Prebiotics and natural beet pulp for fiber help keep their digestive process happy and easy. Different nutritional supplements are built into this dry dog food kibble to help maintain your dog’s health, from bones and joints to the immune system. Although this dog food is designed just for chihuahuas, other dog foods for small breeds can offer similar levels of nutrition. Compare it to our other picks to see which one is the best for your dog! 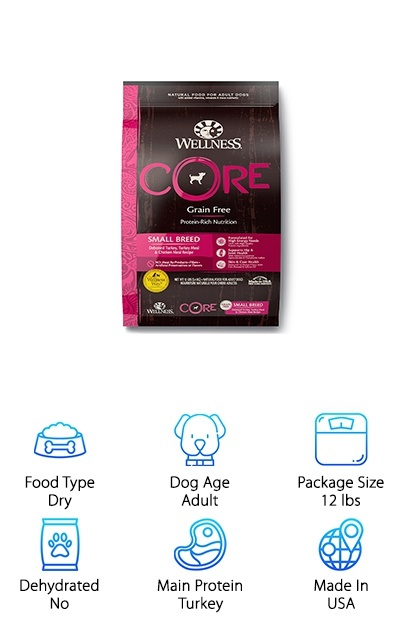 The Wellness CORE Small Breed dog food uses deboned turkey, turkey meal, and chicken meal as the main protein sources. This protein-rich dog food is ideal for active small breeds, plus it’s free of animal by-products. Choose from 4-pound or 12-pound bags. This dog food recipe is also grain-free with no corn, wheat, or soy. Besides the great protein content from “real” sources, this dog food incorporates antioxidants, omega fatty acids, probiotics, and other vitamins and minerals. Ingredients like fish oil and flax oil are just a few sources of great nutritional benefits for your dog. Does your chihuahua turn their nose up at chicken- or beef-based dog foods? Maybe it’s time to try a different bird! Being grain-free and free of animal by-products means you’re getting a high-quality dog food that will be easy for your dog to digest. 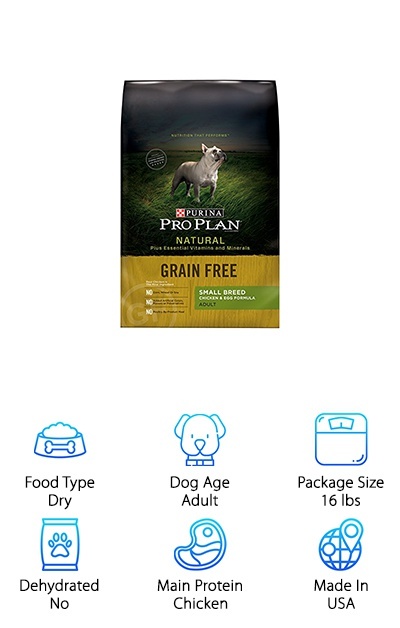 Designed for the nutritional needs of adult dogs under 20 pounds, the Purina Pro Plan Natural formula dog food is easy to digest and can be a great choice for dogs with food sensitivities. The Chicken & Egg recipe is made without grains, soy, or poultry by-product meal, and chicken is the first ingredient. Besides providing the carbohydrates your dog needs without using grains or soy, it contains beneficial ingredients like omega-6 fatty acids, antioxidants, and zinc to support the immune system and a healthy coat. It comes in 4- or 16-pound bags. If you’re looking for a dog food that packs a nutritional punch but is gentle on the stomach, Purina Pro Plan Natural dog food is the perfect choice with a great value! It’s nice to be able to pamper your pup without breaking the bank, and this high-quality, low-price kibble is one way to do it. Hidden in every chihuahua’s ancestry is a wolf, and Blue Buffalo dog food knows it! Blue Buffalo’s small breed and toy breed dog foods come with a variety of different main proteins, including lamb, fish, and chicken. Some dogs have intolerances to common protein sources like poultry, and choosing Blue Buffalo dog food is one way to avoid those ingredients. This dry dog food is also free from wheat, soy, and corn, which are other common allergens for dogs. Some dog owners also like that this dog food doesn’t use poultry by-product meals. Choose from 4-, 6-, or 15-pound bags depending on your needs. 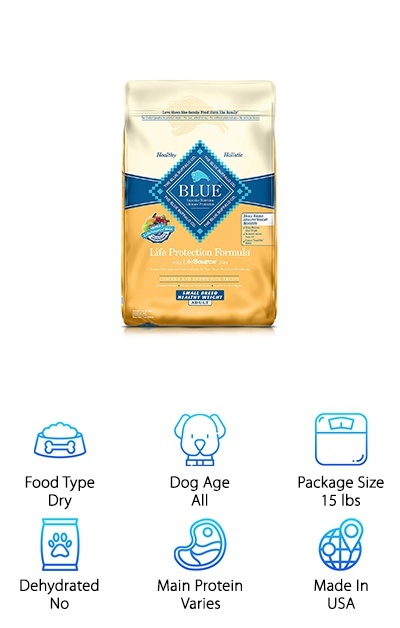 If you want to take a whole foods approach to your chihuahua’s diet, the Blue Buffalo Small Breed dog food varieties are a great choice with great nutrition. Plus, if your dog ever gets a little on the chunky side, there’s a Healthy Weight recipe, too! The Hill’s Science Diet Small & Toy Breed dog food comes in varieties for every stage of your chihuahua’s life, from puppy to adult to senior dog. Available in 4.5-pound or 15.5-pound bags, this dog food comes in a chicken recipe or lamb meal recipe option. Clinical studies back up every variety from the Hill’s Science Diet to test the effectiveness of the ingredients and nutrition. For example, antioxidants like vitamin C and vitamin E help support the immune system, while omega-6 helps keep the coat and skin healthy and moisturized. This dog food comes highly recommended by veterinarians and has no artificial colors or flavors. The puppy variety is a top pick for the best dog food for your chihuahua puppy, tailored to the needs of a growing small breed dog. The great list of ingredients and full nutritional content make this dog food a great choice for your chihuahua. The IncrediBites line of Purina Beneful dog food comes in 3.5-, 6.3, and 15.5-pound bags, perfect for small dogs like chihuahuas. The bags can be resealed with a plastic sliding zipper to help keep the food fresh. These mini kibble pieces are easy for your dog to eat and come in beef or chicken flavors. Both varieties use beef and chicken as the main ingredients. A mix of tender and crunchy kibble textures help to keep your canine interested in their dinner. Small adult dogs will get a nutrient-rich, high-protein meal from this dog food, complete with 23 vitamins and minerals from ingredients like peas, carrots, and sweet potatoes. 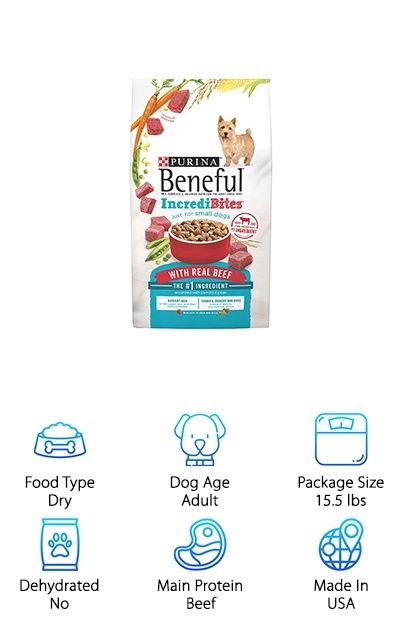 If you’re looking for the best chihuahua food with a value price and a variety of textures your dog will like, the Purina Beneful IncrediBites might work for you! Want a dry dog food that provides the real thing rather than natural flavors? 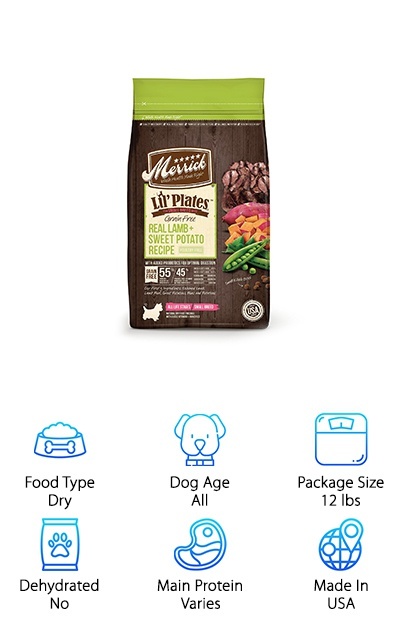 The Merrick Lil Plates line for small breed dogs features recipes with main protein sources from lamb, beef, chicken, or salmon. Available in four-pound or twelve-pound bags, this kibble is grain-free and gluten-free, perfect for dogs with sensitive stomachs. Combined with the main protein are ingredients like sweet potatoes, blueberries, and peas to provide vitamins, nutrients, and fiber. Probiotics and prebiotic fiber help keep your pup’s digestive system running smoothly, and this kibble also supports healthy joints with industry-leading levels of glucosamine and chondroitin. Since the chihuahua breed can be prone to arthritis, providing joint support early on can be helpful. It’s all made in the USA with no ingredients from China, too! This dry dog food is a good way to provide a unique protein source like lamb or salmon to your canine companion, and to ensure that they’re getting the high-quality protein they need. 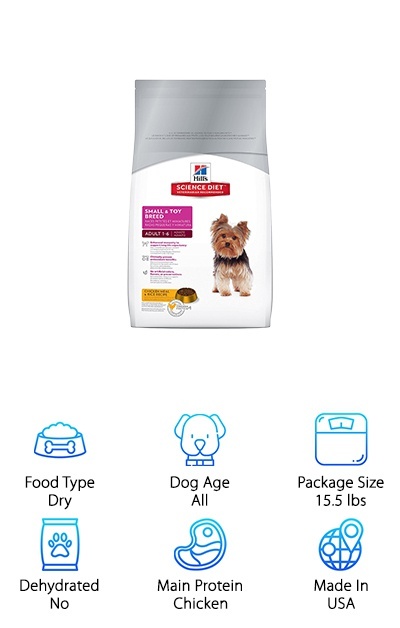 The Pedigree Small Breed Dry Dog Food for adult dogs is available in 3.5-pound and 16-pound bags. The varieties use poultry for the main protein source and are available in roasted chicken or grilled steak flavors. Designed for the nutritional needs of small breed dogs, this kibble is packed with antioxidants, vitamins, and minerals, such as omega-6 fatty acids for hydrated skin and a shiny coat. The kibble comes in small pieces that are easy for your chihuahua to handle, and many people report that their picky dog loves Pedigree dry dog food! Although free of high fructose corn syrup, artificial flavors, and added sugar, this dry dog food does contain grains like corn, which some dogs can have sensitivities to. However, if you’re looking for the best dog food for chihuahuas with a low price and great nutrition, this dry dog food is a great option! If you’re concerned about your chihuahua developing a food allergy or sensitivity, you might be considering rotational feeding. AvoDerm Small Breed Adult Dog Food is a grain-free, gluten-free kibble designed for the needs of your favorite tiny pup. Available with lamb, beef, or turkey as the main proteins, this dog food is designed to be easy to switch around. These different varieties all have the same protein and starch levels, so your dog won’t get an upset stomach when you change to a different option. Rotational feeding is also a great option for canines that get bored with their food or tend to be picky eaters. Other ingredients in this AvoDerm line include avocado for omega fatty acids, vitamin B supplements, and other vitamins and minerals to help keep your dog looking and feeling great. 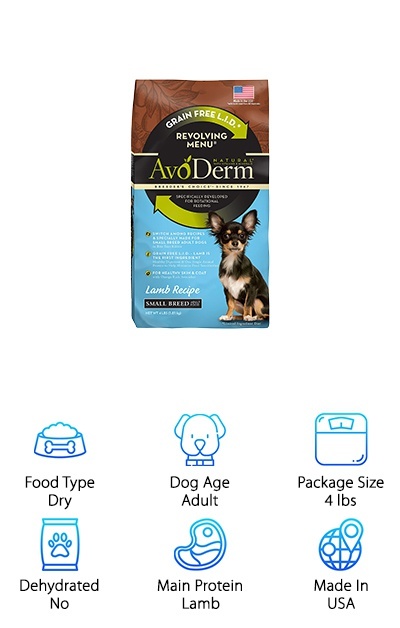 The Small Breed Rotational Feeding line from AvoDerm comes in four-pound bags and is made in the USA!